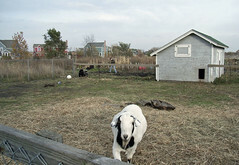 I took a tour of Prairie Crossing last weekend [a few more photos]; here’s a photo of livestock with some houses behind. (I wasn’t aware that some people kept livestock alongside the co-op horse barn.) Not that interesting unless you know that the farmland is permanently protected, I suppose. Some interesting figures: one homeowner estimated that his front "lawn" might have 100+ species. Compared to the site’s previous incarnation as a cornfield, the development has created an interesting human habitat (~1,000 residents, school, a few shops) while increasing biodiversity tenfold (example: 110 bird species on site vs. "10-15" before) and reducing water runoff 50-80%. Lake Aldo Leopold, a.k.a. “stormwater detention basin A,” is among the cleanest lakes in Illinois, with water clarity of 20-30 ft. The Sand Hill organic vegetable/flower/fruit farm grosses $18,000 per acre from sales via CSA and farmers markets, vs. $1,700 per acre in even the current overheated market for corn. We’ve talked about Prairie Crossing a couple of times in my undergrad Planning Great Cities class. Which Metra stop is it again? Prairie Crossing. There are two of them. Geotagged the photo. Note that the MD-N is the only service up there on weekends; best bet is the Saturday 10:30 train up (arrives at 11:45), with trains back at 3 and 5 PM. There’s a coffee house facing the two stations.